I know absolutely nothing about this artist, but his name evokes visions of Belgian sporting legends, or comic book heroes. ....The first Belgian to cycle around the world. Or the threefold winner (in consecutive years!) of Liège-Bastogne-Liège. Or the hero of "Achille Johnny et la collusion diabolique". Reality tends to be more prosaic, - but maybe (or hopefully) not in this case. A quick search reveals that our Johnny has gathered some fame for his song "Mede Woui" (which can be found here), a wonderful slow ballad of the haunting dramatic kind. The second single is less spectacular, but nevertheless pleasant. I like the guitar, but the drummer should have been recorded in another room. PS: does anyone (Oro?) have a photo of Johnny? EDIT: and here is (a small version of) the sleeve, supplied by the ever helpful Zim. To compensate for the lack of sleeve, I have decided to add a second record to this post. Vinyl, - so with sleeve. 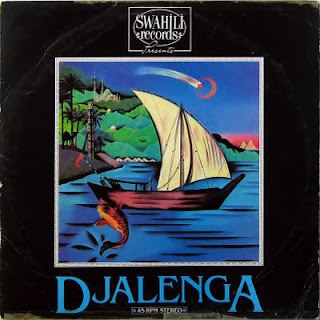 Both "Kweya" and "Djalenga" are compilations, the first from Polygram Kenya and the second from a presumably British "Swahili" label (of which I have only seen this record). The Kweya compilation contains some real jewels, including the extraordinary "Jua Lako" by Moja One and "Dunia Hakuna Bingwa" by Ibeba System (you can read about the complex relationship between some of the bands in this compilation on muzikifan's site). 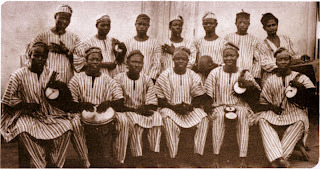 The title song by Orchestra Virunga is a curious example of the use of a drum machine. 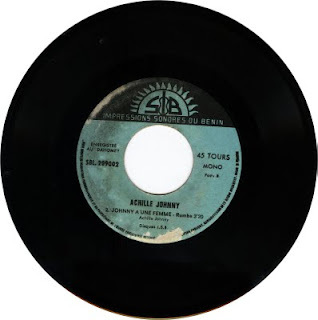 Although I have found no confirmation for this, I strongly suspect the band named as Les Lashow is led by Lessa Lassan, who has two tracks on the "Djalenga" compilation. He seems to have looked for musical inspiration with Tabu Ley. The "Djalenga" songs are enjoyable, but I favour the one on "Kweya". Super Lovy, with Vicky Longomba's son, is another band with ties to Moja One and Ibeba. Their "Etali Yomoko" is not one of their better songs, if you ask me. 'Odd ones out' in these two compilations are Sam Mangwana on "Kweya" with "Masai", in the unique relaxed Mangwana style (I like the ox imitations at the end), and "Nimesha-Kwambia" by Super Wanyika on "Djalenga", - a great track for long busrides. * come to think of it, it is likely the number should be 551, as Muzikifan states. Here is one of those rapid posts. 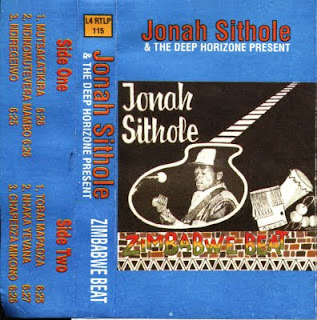 This cassette of Jonah Sithole and his band The Deep Horizon was given to me by the artist himself, when he visited Amsterdam in 1996, a year before his sad demise (see my earlier post). 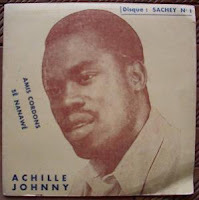 I don't wish to sound stubborn, but despite efforts by others to push this great artist into the mist of oblivion, to me Jonah is still one of the Greats of Zimbabwean music. Not just the man himself, but Thomas Mapfumo too has pointed to him as the 'inventor' of mbira-guitar in the Chimurenga music of the Blacks Unlimited. And who am I to argue with 'the horse's mouth'? This wonderful cassette by Jonah's own band was recorded in the mid-1990s, and has - as far as I know - never had a global distribution. I have to admit I am not very good with religion. Over the years I have come to the conclusion I am just not the believing, the submissive or the worshipping kind. But should I ever - for reasons I can not imagine at this moment - get the urge to repent, it is very likely I will turn to Islam. For one thing, they have better music than the competition. And with this post I am presenting some very convincing evidence of this thesis. 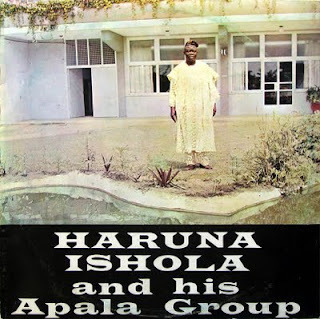 Yes, you have guessed it: it's another album by that master of Apala music, Haruna Ishola. From a time (mid-1970s) when he had not yet, I assume from the absence of the "Alhadji" adjective, done his duty as a muslim to travel to Mecca. You may wonder why I have not been posting in the last couple of weeks. Well, I have been putting my feet up, - but strictly for medical reasons. I have had some surgery done on my foot, and was therefore distracted from sitting behind the computer. And after that, I had a lot of catching up to do both family- as well as workwise. I will try and make this up with a few 'rapid' posts, i.e. with a minimum of textual interference. And the first of these is a referral to a YouTube posting by friend Aboubacar Siddikh of a recording I can - even after (exactly) twenty years - barely listen to. It is the last live performance of that immortal legend of African music, Franco. The fact that he decided to play in this song ("Chacun pour soi" by Josky Kiambukuta) which he had used on previous occasions as a kind of 'pièce de résistance', made the whole scene even more tragic. Listening to the frantic attempts of this once all-powerful giant was one of the most painful moments in my personal musical memory. Please note the superb photos made by Ton Verhees. And read Aboubacar's notes. In the next few weeks I will dedicating more posts to Franco and his legacy (probably with some of the 15 Years Ago and In Memoriam series, plus some singles).